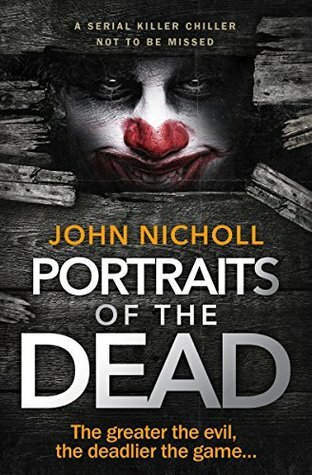 Firstly I wish to thank Sarah Hardy of Bloodhound Books for inviting me on the Blog tour for Portraits of the Dead by John Nicholl. I didn’t really help myself when I was sat in bed at 2 o’clock in the morning with my Ovaltine and a thought of I will just read for a while before I go to sleep because OMG! I wanted to sleep in my wardrobe just so no-one else could hide in there after I had read the first chapter. Damn this man. John Nicholl had done it again with me in the very first chapter, he is good, no he is brilliant at getting me right at the very first couple of hundred words. There was only one thing for it. It was going to be a long night! I was going in. Now if you thought IT was scary for the kids in it, then double the scare factor here for adults because this is one mean son of a psycho that got into my head. For a lot of young women it was already too late, five of their portraits hung on the wall in this sound proof room but there was plenty room for more to be added and for Emma she was just at the start of her horrific ordeal. Oh wow there is being frightened and there is wakening up to discover slowly the horrendous things that have been done to you. Could this man be called human? I read every new discovery with my hand over my mouth. John Nicholl is very graphic with his descriptions and does put you there in amongst the worst of it. It wasn’t going to be the first appearance for DI Gareth Gravel and DS Clive Rankin in John Nicholl’s novels but the disappearance of a 19-year-old student wasn’t causing a great deal of concern with either of them except for the fact that the girl’s mother was a personal friend of someone high up the chain of command. The two detectives play a much bigger role in this book than previous ones. They were frustrating at times, all part of their characters in the story but at times I wanted to batter them. It is very early on that you discover who the bad guy is which does add to the way I viewed how the case was handled. There are so many shocks in this story that I really was left speechless. So much I just didn’t see happening. John Nicholl is definitely a man with very dark thoughts. Super read! Bring it on Mr. Nicholl! I am camped out in my wardrobe and waiting. Thanks! I think I must read this one. Great post.